If you have ever picked up a county map from any county in the state of Ohio, you will see the County Engineer’s name followed by the four letters “P.E., P.S.”. All county engineers in Ohio are required by law to be both a licensed Professional Engineer (P.E.) and a licensed Professional Surveyor (P.S.) in Ohio. To become a Professional Engineer, a person must first graduate from an accredited four year engineering college or university. That person is then eligible to take an eight hour Fundamentals of Engineering (FE) exam. If the person passes the FE, he or she receives the title E.I., or Engineer Intern. The person must then intern for four years in the field of engineering. That person may then apply to take an eight hour Principles and Practice of Engineering (PE) exam to demonstrate their proficiency in one of the various fields of engineering. If the person passes the PE, he or she becomes a licensed Professional Engineer in Ohio by the State Board of Registration for Professional Engineers and Surveyors. Before being qualified to run for the office of County Engineer, a person must also demonstrate their land surveying proficiency. To become dual licensed as a Professional Engineer and Professional Surveyor a person must first graduate from an accredited four year engineering college or university. Additionally, the person must have at least 24 credit hours in surveying or related courses, as determined by the State Board of Registration. That person is then eligible to take an eight hour Fundamentals of Surveying (FS) exam. If the person passes the FS, he or she receives the title S.I., or Surveyor Intern. The person must then intern for four years in the field of land surveying. That person may then apply to take an eight hour Principles and Practice of Surveying (PS) exam to demonstrate their surveying proficiency. If the person passes the PS, he or she becomes a licensed Professional Surveyors in Ohio from the State Board of Registration for Professional Engineers and Surveyors. Once the person has received both a Professional Engineer license and a Professional Surveyor license from the state of Ohio, he or she may run for the office of County Engineer, provided they meet all other election requirements of the office. There is a reason for requiring an individual to have both a Professional Engineer license and a Professional Surveyor license before running for County Engineer. He or she must have the engineering knowledge and experience to carry out Section 315.08 of the Ohio Revised Code which states the County Engineer “… shall prepare all plans, specifications, details, estimates of cost, and submit forms of contracts for the construction, maintenance, and repair of all bridges, culverts, roads, drains, ditches, roads … within and for the county.” Additionally, the county engineer reviews all land descriptions for deeds and prepares tax maps of all parcels in the county. To perform this service properly, he must have land surveying knowledge and experience. 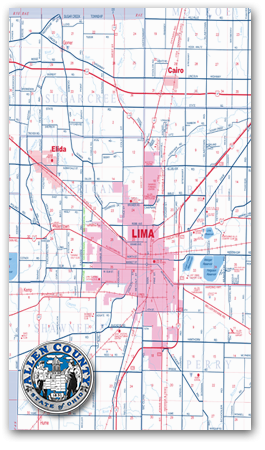 The County Engineer must also have the engineering and surveying knowledge to work closely with the township trustees and the Ohio Department of Transportation in cooperative efforts to improve township roads and state highways. The county engineer is also involved with the Regional Planning Commission in matters relating to our local roadway system.